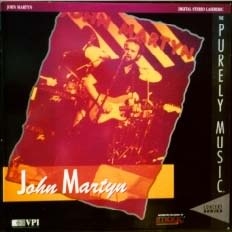 Released by Image Entertainment on 16th January 1992 this is the only John Martyn release on laserdisc. Recorded in 1986 and approx 45 minutes long, this features a rare live version of Piece By Piece. A very good recording but hard to find and of course you can only play it on a laserdisc deck! The show has also been broadcast on TV. Now available on DVD, see the Empty Ceiling release.